At St Mark's Hall for an exhibition about prefabs. The Excalibur Estate has always had a special place in our hearts. 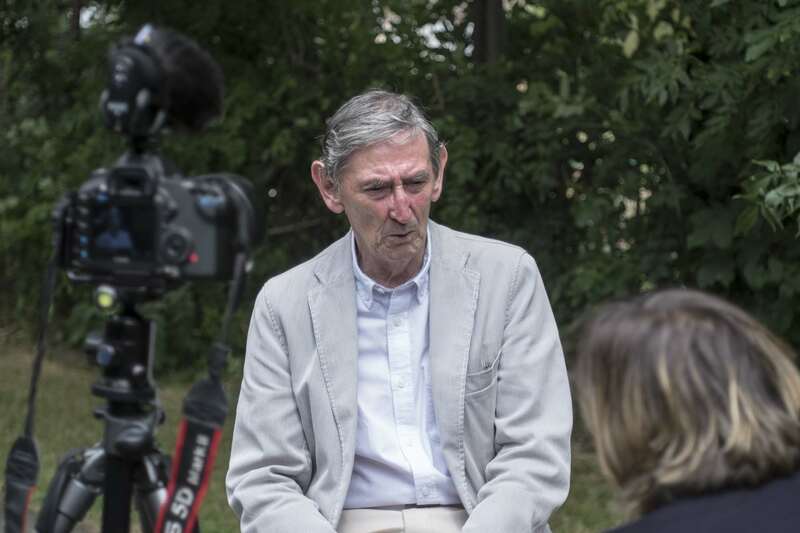 Jane and I have been working, photographing, filming, walking, talking (a lot), laughing and even partying on the estate for years and even decades. Although we never lived there, we have developed a deep and personal attachment to this estate the Queen Mother painted as a “holiday village”. When we went back to the estate on the 24th of June, we found out the image of the happy holiday village had long gone. After about one fourth of the prefabs were demolished by the local authorities in July 2014, multiple storey inconsistent dwellings are being built in phases while more and more prefabs are being boarded up. About 100 seem to be still lived in. Walking around with my camera, I almost felt sick to see the estate had reached such a state of neglect and sadness. I stopped at 17 Meliot Road, a prefab which used to be for 7 months the physical Prefab Museum from March till October 2014. I was deeply saddened to see it all boarded up but curiously all painted in grey, like a few other ones. Some had builders working on them. I talked to one of them who told me they were refurbishing the “grey ones” and that they had been painted in the same colour so they could recognise them from the others. He added they were refurbishing them so some guardians could temporarily live in them. The irony is: one of our prefab friends later read in the paper the “grey ones” had a demolishing notice on them So what was the point refurbishing them, spending money on them? After my little prefab walk on the estate, I joined Jane and our guests at St Marks Community Hall, behind the church. It was time to start our prefab celebration day in partnership with ASH – Architects for Social Housing – and our prefab friend Senaka who suggested the joint event as part of Open Garden Estates and London Festival of Architecture. 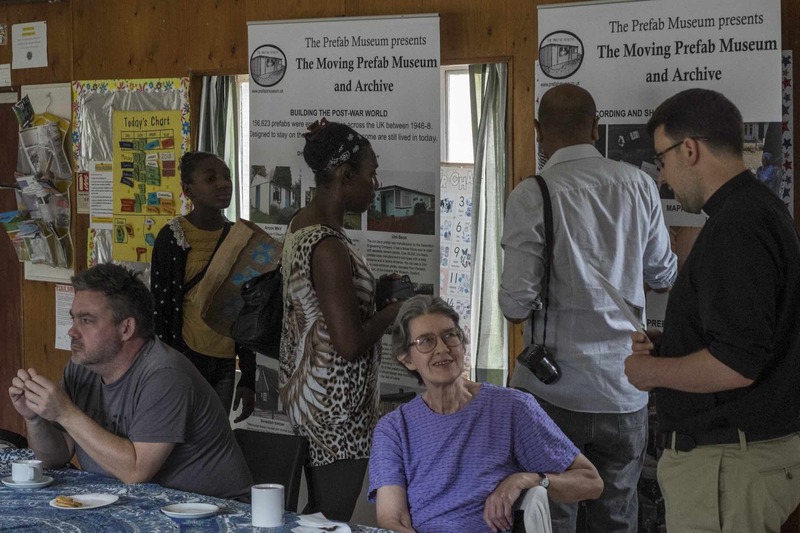 Thanks to Janet Hurst, we were able to rent the hall and had a great day of prefab chats, photo and archive exhibition, films screenings and debates! We printed out maps in case people would want to see the estate and perhaps be lucky meeting residents who’d talk to them and even invite them in. Talking about residents, we were happy to see some turned up at our event. It was good to catch up with them, and listen to them. We also met new prefab enthusiasts who were very keen to share prefab memories and stories to feed our growing archive. Familiar and friendly faces paid a visit too. 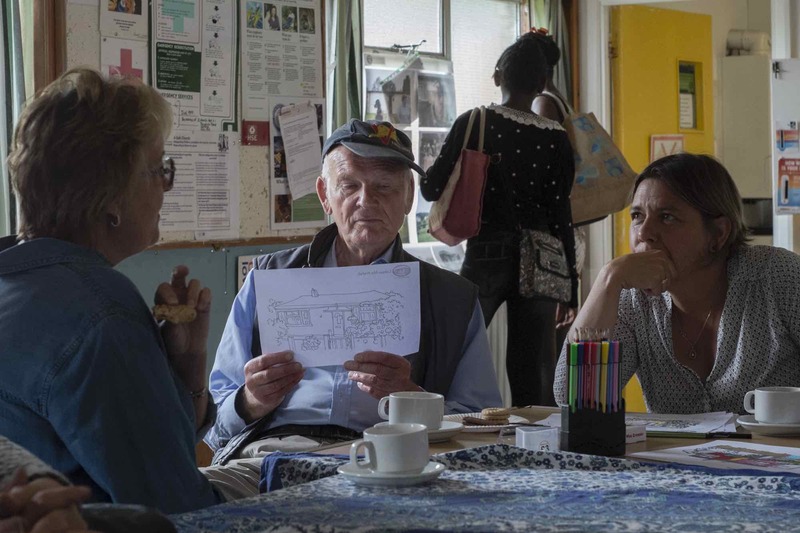 Volunteers like Sonia, Keara, Lucia, Solange, Christine and Vicky – a newcomer from San Francisco who grew up in Catford -, always keen to join and spend more time learning about prefabs, listening to people and serving more tea, coffee and cakes to our lovely guests! 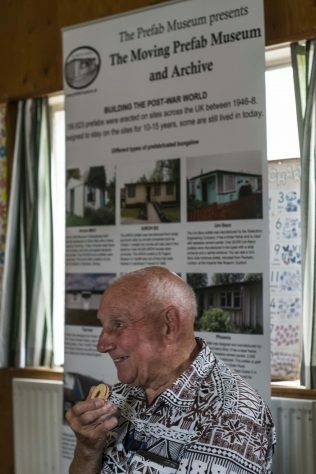 We were very pleased to see Ray Smith, who grew up in a prefab in Penarth, South Wales, come back to meet us. This time, Selim and I managed to take a bit of time with him, recording his early childhood memories, which will be on line soon on our Vimeo channel. The afternoon ended with an interesting Q & A about the future of the Excalibur Estate and the potential use of prefabs today. and of course, we left late. Despite the sad state of the Estate, we left happy, hoping the feeling was mutual to everyone who came. I was born in 1947 at 9 Ector Road. We lived there until I was 10 or 11. All the grown ups went to one house on Fridays to watch a TV program. My late wife’s Aunt Beat and Uncle Ken lived in one of the Excalibur Estate prefabs for many years. They moved out during the 70s to live in Mark’s Tey, Essex. Their prefab was very cosy. My Barbara and I would have been pleased to have lived in one. Glad that some of the estate is still inhabited. Prefabs are ideal accommodation for small families or elderly people. 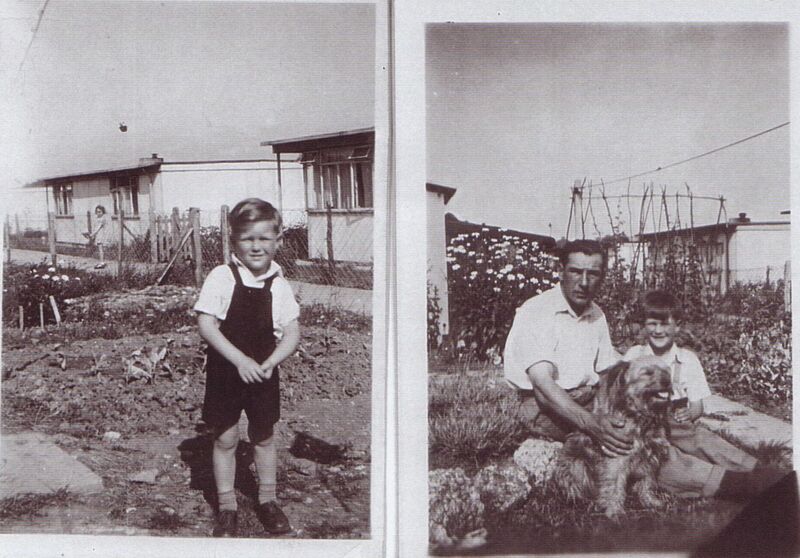 Mystery prefabs - can you help us locate them from this list? The Moving Prefab at Eden Camp - and an unexpected discovery! Moving Prefab Museum Archive - submissions and puzzles!